A series of motorized twoway rotary valves, DN15 to DN150, with flanged-end connection. 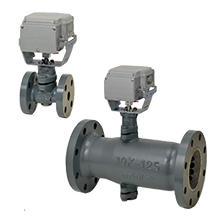 ACTIVAL™ Model VY51_ _J is a series of motorized twoway rotary valves, DN15 to DN150, with flanged-end connection. The valve and actuator are integrated in a single unit. Pictures of DN25 and DN125 are posted. The shape differs depending on the valve size.